Navigate: Home → Alphabetical → David Gerard [Link Partners] [Help] → Help support the e.Gallery! Gerard David (b. ca. 1460, Oudewater, d. 1523, Bruges), was a Flemish painter who was the last great master of the Bruges school. David went to Bruges, presumably from Haarlem, where he is supposed to have formed his early style under the instruction of Albert van Ouwater; he joined the guild of St Luke at Bruges in 1484 and became dean in 1501. 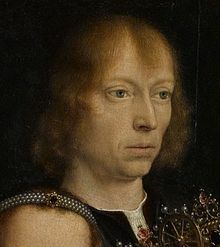 In his early work, such as the Christ Nailed to the Cross (National Gallery, London) and the Nativity (Museum of Fine Arts, Budapest), he followed the Haarlem tradition as represented by Ouwater and Geertgen tot Sint Jans but already gave evidence of his superior power as a colourist. In Bruges he studied masterpieces by the van Eycks, Rogier van der Weyden, and Hugo van der Goes and came under the influence of Hans Memling. To this period belong the Marriage at Cana (c. 1500; Louvre, Paris) and the Enthroned Madonna with Angels (Darmstadt). But the works on which David's fame rests most securely are his great altarpieces — the Judgment of Cambyses (two panels, 1498) and the triptych of the Baptism of Christ (c. 1502–07) at Bruges; the Virgin and Child with Saints and Donor (c. 1505; National Gallery, London); the Annunciation on two panels (Metropolitan Museum of Art, New York); and, above all, the documented altarpiece of the Madonna with Angels and Saints (1509, Mus�e des Beaux-Arts, Rouen). These are mature works — severe yet richly coloured, showing a masterful handling of light, volume, and space. The Judgment panels are especially notable for being among the earliest Flemish paintings to employ such Italian Renaissance devices as putti and garlands. In Antwerp David became impressed by the life and movement in the work of Quentin Massys, who had introduced a more intimate and more human conception of sacred themes. David's Deposition (c. 1515; National Gallery, London) and the Crucifixion (1510–15; Genoa) were painted under this influence and are remarkable for their dramatic movement. Authorities disagree about the intent of David's eclectic, deliberately archaic manner. Some feel that he drew on earlier masters in an effort, doomed by lack of imagination, to revive the fading art of Bruges. Others see David as a progressive artist who sought to base his innovations on the achievements of the founders of the Netherlandish school. From October of 1916 through January of 1917, Rudolf Steiner gave a series of nine lectures known as the Art Course. These lectures were given the title of: The History of Art. Click here to discover what Steiner said about Gerard David in the sixth lecture, or in the entire lecture series.